There’s a new Mexican Restaurant and Bar in town and it is already booming with success. El Toro Loco brings a lively and festive approach to the food industry and new customers are loving it. The goal of El Toro Loco has always been to ensure that customers come in and out the door smiling. El Toro Loco calls itself a Modern Mexican Kitchen and Tequila Bar and has recently opened their doors earlier in March. The restaurant’s owner, Woody, has been hard at work to create an establishment that is authentic and entertaining. With several other successful restaurants under his belt already, Woody has a business mindset that works and that customers love. The goal of El Toro Loco has always been to ensure that customers come in and out the door smiling. This positive energy is only amplified by the restaurant’s delicious food menu and expansive drink selection. El Toro Loco truly brings the tagline “Modern Mexican Kitchen” to life with dozens of authentic Mexican dishes available for customers to enjoy. Furthermore, the bar boasts happy hour deals as well, with discounted drinks every weekday from 4PM - 7PM. Outside of these deals, El Toro Loco features close to 100 different types of tequila, ranging from affordable options to true top-shelf quality liquor. As a special treat, El Toro Loco also holds events every weekend. For example, they bring in a live DJ to liven up the dance floor every Friday from 10PM - 2AM. Saturdays are for Latin nights. Here, customers can enjoy dancing along to fiery Latin music while sipping on flavorful margaritas, again from 10PM - 2AM. On Sundays from 11AM - 4PM, El Toro Loco invites a more family friendly crowd with their Sunday Brunch specials. Every Sunday Morning, customers are treated to exclusive brunch dishes that feature unique brunch recipes and dishes that are unavailable any other time of the week. 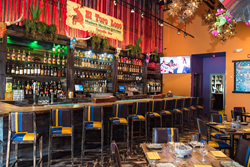 Although El Toro Loco has had their doors open since the middle of March, their official grand opening is scheduled for Cinco de Mayo, May 5th. El Toro Loco is located at 3000 Route 27, Kendall Park, NJ, 08824 and can be reached via telephone at 732-422-5900. They are also active on social media and invite others to connect with them on Facebook and Instagram using the hashtag #ElToroLocoNJ. Any other questions can be answered by visiting their website as well.